1 ARE YOU TIRED OF CLUTTER? 2 SIX COLORS, LOOK NICE AND PRACTICAL. As pictures shown, colorful hooks dress up your fridge, metal wall, blackboard etc. and make your decoration more beautiful. 3 NO TOOLS REQUIRED. QUICK AND EASY TO ASSEMBLE. - Put them on any magnetic surface. - No drill. No holes. No mess. 4 GREAT FOR PERMANENT OR TEMPORARY USE. - Never lose your keys again with magnetic hooks. - Great for hanging seasonal decorations. - Take them on the road with you for extra hanging and storage solutions. workplace lockers, steel kitchen backdrops, RV's, magnetic whiteboards, steel shelving or any other magnetic surface. - Handy to help organize tools, sporting equipment, kitchen utensils, keys, gardening equipment, cables and wires, calendars and much, much more. QUALITY MATERIALS FOR LONG TERM DURABILITY- Our magnets are made of ORIGINAL NEODYMIUM, which makes them light, strong and durable throughout all weather conditions. This way you can rely on your magnets for long-term use even outside your home, without worrying about any damage.Three layers nickel coated on magnetic hooks greatly reinforces corrosion resistance ! Maintenance free, no rust ! MULTICOLOR PROCESS- magnetic hooks, including Purple,Gold,Yellow,Green,Blue,black, beautiful and professional electroplating process . Apply to any environment without rust and keep the color bright for a long time. MULTIPURPOSE USE -These colorful cute magnet hooks make great home, garage, shop, warehouse and office organizers. They are handy for hanging everything from tools, equipment, utensils, components, supplies and products to sales, sports and safety banners everywhere you work and play. NO WORK AND NO WASTE OF TIME No tools required.Quick and easy to assemble.Put them on any magnetic surface.No drill.No holes.No mess. 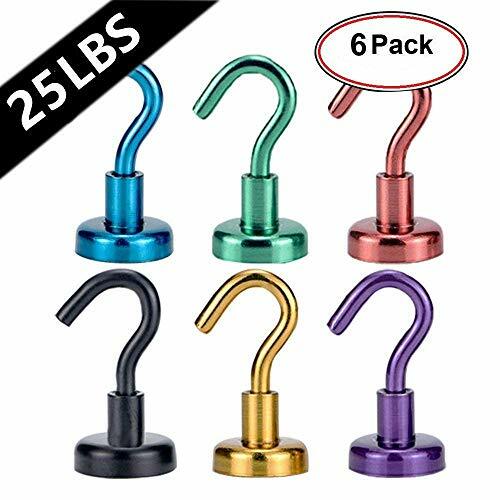 Even more they are attractive and will add colors to your space.Each of the hook weights 21g,the Maximum Vertical Attraction is 12kg(When attracting on the smooth surface of pure iron ,strength maximum 25 pounds).Horizontal pull attraction is reduced by 2/3 if attached vertically.The hook can be separate from the pot magnet. PRODUCT GUARANTEE-: If the Magnetic Hooks do not meet up to your expectation, you can kindly return them and we will Refund with a Smile. There is no risk at all. Why not try? If you have any questions about this product by Magician&, contact us by completing and submitting the form below. If you are looking for a specif part number, please include it with your message.